Late Autumn and Early Winter are the times of year dominated by Vata dosha in Ayurveda. The warm rays of the Sun are at their minimum around Winter Solstice. The darkness of night time is at its maximum. And what is darkness if not the unknown? And what stimulates fear, if not the unknown. And is not death the greatest unknown of all, that all humans are naturally afraid of. And which month symbolizes death? Spring is growth and life and new things green. Summer is the accomplishment of all that Spring started. Autumn is the harvest, but also the great loss of Summer. Winter is the deep experience of that loss that begins in Autumn. But it is also the time of storage, storage of all that we learned in the previous year, time to consolidate and to mend the carpets and furniture, and to sharpen the tools for the coming year. Summer and all that it gives is fire and earth—fruits, flowers, foodstuffs, the sun, fragrances; in Summer we are full of distractions—as farmers there was so much work to be done, as hunter-gatherers, too. 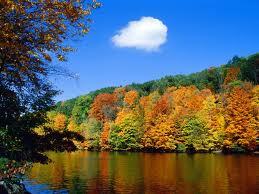 But Autumn was the transition from this profusion of life to the stillness of winter. November in Europe was blood-month, the time the animals whose flesh would provide for winter were slaughtered and whose flesh was then cured and transformed into foodstuffs that would sustain us across the risky winter months when starvation was a possibility. No wonder people can develop depression in Autumn. And the long dark nights of Winter are the essence of Vata. What is Vata? Air and space. And what is space, if not infinity, and is the consideration of infinity not naturally philosophical, the characteristic of Vata. Looking out into the dark sky at night we are made small and conscious of how little we are by comparison. And darkness is the unknown and the unknown creates a natural kind of fear…but this is a fear, that, when you ride the wave, can put you into contact with those things larger than yourself. No wonder so many religious rituals were done at night in Autumn and Winter. Midnight Mass on Christmas, for example. Deepavali and Kartigai Deepam for Hindus. Chanukkah for Jews. So in Vata season when our anxiety, or fear, naturally elevates through the long periods of cold and darkness, we can exploit this natural feeling to go inward. This is Yin time in Chinese Medicine, the time of maximum Yin where the Qi in our body’s recedes to its deepest levels. Even our pulses are deeper in winter. Yin is the shadow, being Yin is sinking your roots deep into the earth as we do in the horse or bow stances in Tai Qi Chuan. This is the time to sink into your roots and ride the wave by connecting to those things larger than yourself, through meditation, but also though connecting to those profound energies we can access through creative pursuits such are art, poetry, and music. This is very different from the energy of money making and tasks and endless to-do lists and accomplishments associated with the fire of Pitta that shines in summer when you go out and paint the house and pour concrete in the backyard, and clear rocks from the new field you just cut the trees down from. Vata dosha is the dosha of creative energy, Vata dominant people when balanced are quick witted and creative and connect naturally to deep thought and philosophy. The 14 year old Vata kids look at the sky and wonder. Winter is a time of great wonderment when you walk out into the rolling hills on a full moon night and all is blanketed by snow and the air is crisp and there is no sound save the crunch of your boots in the snow. Across the field a child laughs and you feel her laugh more acutely for the silence and calm? We can ride the natural wave of Vata during these long nighted days of late Autumn early Winter by connecting with things larger than our self instead of fighting it by flying to the Caribbean for a get away in the sun. Its a good time to allow for some calm, quiet melancholy, for pathos and empathy that is stimulated by a melody or a painting or a hug of the dog. Its a good time for whiskey or sake in moderation. Making your own Christmas greeting cards by cutting out interesting photos from old books or magazines is a fun creative pursuit you can do alone or with family. This is the season to balance the cold and night with warm, heavier food. Paradoxically, your digestive fire is stronger in winter because your metabolism is stoked up to keep you warm and your Agni is stronger. In summer people get exhausted from the heat and can lose their appetite. Winter is the opposite. So get out into the kitchen and have fun. Be creative. Try new foods and new recipes. Take a music or art class or start writing or at least reading poetry. Open to the non-logical non-rational brain. Humans are afraid of the dark because at night we cannot see, and sight is our primary sense organ. At night things don’t “make sense” compared to during daytime. Chinese medicine says men are more yang and women more yin. Women are alleged to be more intuitive than men. Well, this is the season for it. Ride the wave…. Excellent overview, reminding us to slow down and appreciate the recurrent cycle of nature, corresponding to our own ongoing processes of inner growth, healing, and transformation. This understanding includes valuing the invisible generative activity, the pulsing energy underlying all, both hidden from us and yet revealed to our deeper selves through the medium of darkness, which gives us the opportunity for intuitive insight. Damn, that is so on point.